Blend the corn, queso fresco, cream and salt and pepper to taste. Heat this sauce in a pan until it begins to boil. Add the biscuits to an ungreased baking dish. Bake until browned. Serve with the corn sauce and sprinkle with cilantro. You can use requesón instead of queso fresco. I’m sure that if Thanksgiving is celebrated in Latin America, the menu is made up of some corn dishes and other plates seasoned with cilantro and other spices. In the United States, these are known as biscuits and can always be found during the holidays. They’re usually served with the traditional gravy, a sauce that can is prepared with the juices from a cooked turkey. 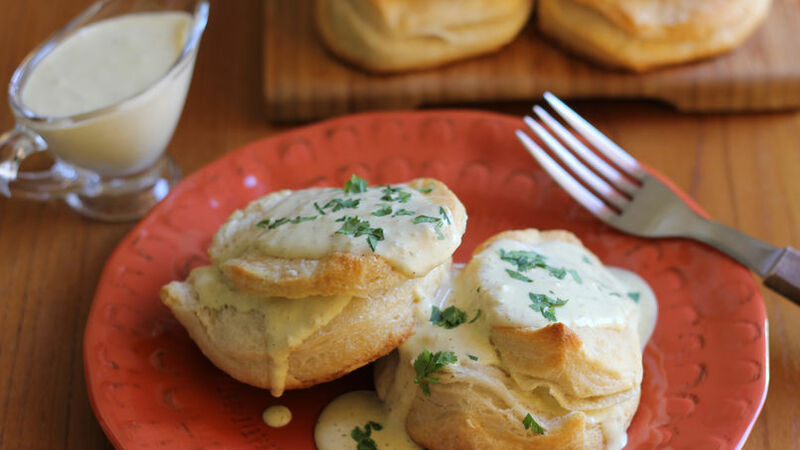 To throw a party with a Latin touch, we could try serving these tasty biscuits with a delicious corn sauce. Save this recipe for Thanksgiving and be sure to prepare enough because everyone’s going to want some!